The Forty Hours' Devotion or more commonly known as the Forty Hours, is a definite form of divine worship of the Blessed Sacrament in the Catholic Church. This form of worship is effected by the Holy Eucharist being solemnly exposed for adoration for forty hours in memory of the period of time Christ's Body lay in the tomb, and for the purpose of making reparation. 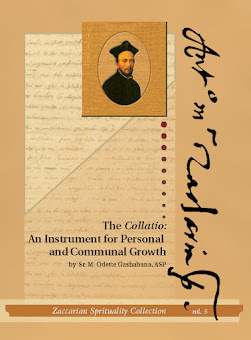 The founder or institutor is the person responsible for starting this particular devotion. The Forty Hours' Devotion presents a process of successive developments throughout the ages. From very simple and almost private beginnings, all of a sudden this devotion assumed a solemn and resplendent form of worship universally accepted. In the first part of the Sixteenth Century and up to the Council of Trent, it was not an era in which the spirit dominated over matter. The Renaissance had awakened the people but it also had a corrupting influence on their morals. What marked the religious decadence in these years was the culmination of evil customs and abuses of the preceding centuries. All sorts of abuses were prevalent even in churches with practices unbecoming to divine worship. The Holy Eucharist the glory and the most treasured possession of the church was the subject of profanity, irreverence, and indignities, As a result, Christ in the Eucharist was exiled from His churches and relegated to obscure corners of sacristies. 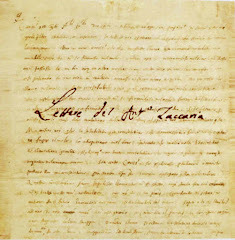 It was evident that in order to reform the Christian people, the churches had to be restored to their former splendor of the house of prayer; the Blessed Sacrament had to be returned to its church and take a prominent place in it, and the people had to be brought back to Christ in the Holy Eucharist. It is the Forty Hours' Devotion which really became the means of accomplishing this. A Eucharist devotion under such name was established back in the Twelfth Century in the city of Zara. It was Pope Alexander III who gave his approbation and granted an indulgence for this pious practice. Mention of Prayer of the Forty Hours was made in Milan In 1527 and again in 1529. The Forty Hours' Devotion as we know it today in the Catholic Church did not start until 1537, and this took place in Milan, Italy. 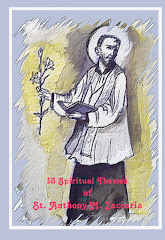 St. Anthony Mary Zaccaria is the founder of the Forty Hours' Devotion. In his zeal for the salvation of souls, St. Anthony Mary had already founded two religious orders, one of Priests, the Bamabite Fathers, and one of Nuns, the Angelics Sisters of St. Paul. Devotion to Christ Crucified and Christ in the Blessed Sacrament was the double-edged sword which the Saint employed in combating the enemies of the Church of that century. Before he became a Priest, he was a Doctor of Medicine. His medical experience helped him to put his finger on the sore spot of the society of his day which was a conspicuous lack of Eucharistic life among the people. To obviate this critical situation, he plunged into a great sea of activity. 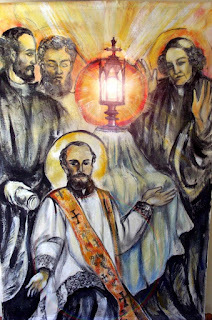 In 1539, when only thirty-six years of age St. Anthony Mary Zaccaria died of sheer exhaustion, obedient to the common of St. Paul never to spare oneself when the glory of God and the salvation of souls are involved. Some sources refer to the Forty Hours as having been started in 1534 in Milan by a Cremonese hermit Fra Bono. Documentary evidence, however, points to the year 1537 as the most probable. In regard to Fra Bono, it has been ascertained that he was what one might call the right hand of St. Anthony Mary in establishing this devotion and in preparing the churches to receive it. In that same year of 1537, there was in Milan a Capuchin Father who was famous for his preaching and holiness of life, Father Joseph Piantanida de Femo. The Capuchin sources testify that Father da Femo seeing the distress of the city because of wars promised peace from God while preaching if the Milanese people would take over the Forty Hours’ Devotion for one year. Bamabite tradition and the testimony of an eye witness of the events of the year 1537. The Capuchin tradition was codified almost half a century after the narrated facts. By then, the Forty Hours had been accepted in most of Italy through the merits principally of Capuchin Fathers. The fact that Father Joseph da Femo was the first Capuchin to promote the Forty Hours in his missions helped to confuse the issue. is, therefore concluded that St. Anthony Mary Zaccaria with his first followers is the founder of the Forty Hours' Devotion. He exposed the Eucharist with solemnity without the use of veils and richly adorned it with tapestries, lights and flowers. He proposed and obtained that each church of the city take up in turns the Forty Hours' Devotion. Probably, the Saint would not have had such a great response from the people if the preacher of the Cathedral, Father Joseph de Femo, had not recommended in his fervor and zeal the practice to the faithful. At the present stage of study, the following represents the conclusions of the problem. Father Joseph da Femo is the first promoter of this devotion throughout Italy and the greatest in accomplishments. St. Anthony Mary Zaccaria is the founder of the Forty Hours' Devotion as it is know today in the Catholic Church, that is, a solemn and public exposition of Blessed Sacrament observed in all of the Catholic Churches. Abstract from theses “The Origin of the Forty Hours Devotion and its Modern Founder” Presented by Fr. Louis Peter Bonardi, CRSP to Niagara University, 1961).